And this is my take on the challenge. I did not have a clover stamp set or die. So I decided to improvise and use heart punch to make my clovers. 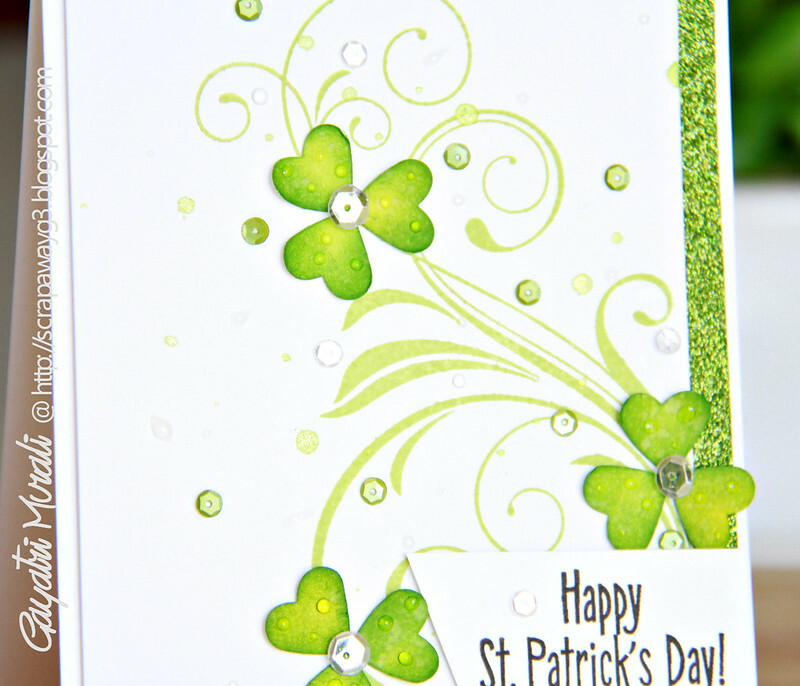 On my card I stamped the large flourishes from Papertrey Ink with green ink. Then spattered some green colour shine all over the panel and left it to dry. Then I sponged some Crushed Olive distress ink on a scrap piece of cardstock then punched out some hearts. Then sponged some Mowed Lawn distress ink on the heart and left them to dry. I then trimmed the dried stamped panel, added a strip of green glitter on one side. Then I glued the punched hearts in threes to form clovers and added Sparkly Clear 6mm sequins from Pretty Pink Posh at the centre. I also glued 4mm Mossy green sequins randomly all over the panel. The panel is mounted on the card front. I felt the card needed some dew drops. An easy way to add dew drops is glossy accent. That is what I have done. Sentiment is from Hero Arts. Pretty Pink Posh is giving away $25 gift certificate to one lucky winner. I love your pretty flourishes adorned with the shamrocks! Wonderful card Gayatri!! This card is GORGEOUS!! Love the makeshift clovers and beautiful green flourishes! 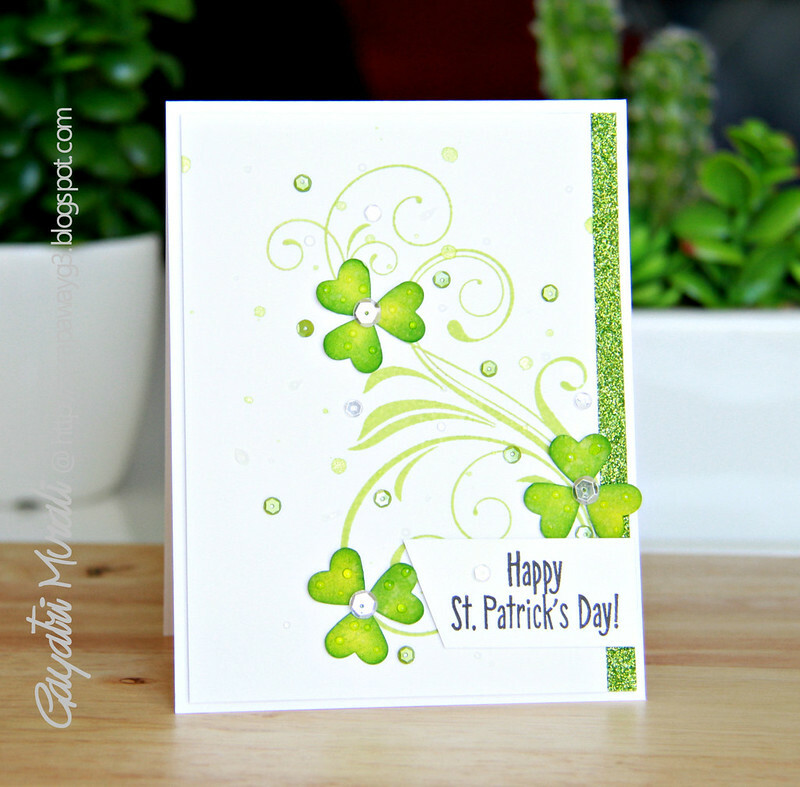 This is the prettiest St Patrick's Day card I have ever seen! I love the color, the flourishes, the heart/clover leaves, & sequins. This card is so fun!! I LOVE that you improvised and used a heart stamp. I am going to have to CASE this!! Fabulous card! !